Once you've connected your store to Mailchimp and turned on e-commerce tracking, we'll let you know how much revenue you've earned from email marketing. Use this data to track individual product sales and total campaign revenue, and target your customers with personalized offers so you can earn even more. In this article, you'll learn how to view the revenue you've earned from email campaigns. To view revenue data, you must first connect your store to Mailchimp with an e-commerce integration or the API. There are a few places to view revenue in Mailchimp: contact profiles, campaign reports, and your Dashboard. Mailchimp displays net revenue, which excludes shipping fees and taxes. For a broad overview of orders and revenue you've earned through Mailchimp campaigns, check out your main account dashboard. We'll show orders and revenue generated from your recent campaigns and automations. To view e-commerce data in your Dashboard, follow these steps. In your Mailchimp account, save and close any campaigns you're working on. 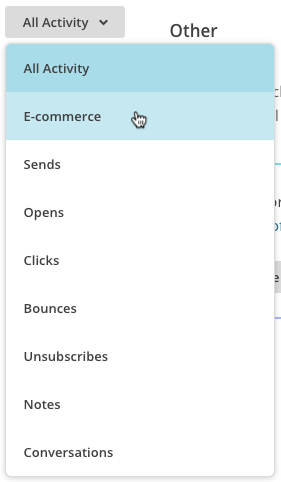 Click the Mailchimp icon in your account navigation bar to go to the account dashboard. Scroll to the E-Commerce performance section to see how well your connected stores are doing, and how much revenue you're earning via Mailchimp. Use campaign reports to find out how much money you earned in a specific email campaign or automations. Your reports will show orders, average order revenue, and total campaign revenue. To view e-commerce data for a specific campaign, follow these steps. Click View Report next to the campaign or automation you want to work with. Click the E-commerce tab to view Product activity or Order history. Click Product activity to view a list of products sold through the campaign, purchases generated by Product Recommendations, and revenue totals. Click Order history to see a record of subscriber purchases. To filter purchases by a different store, click the View store drop-down menu. For a deeper dive into reports, check out these articles: About Email Campaign Reports and About Automation Reports. For a more precise view of e-commerce data, you can track revenue details for a specific contact on their profile page. To view e-commerce data in a contact profile, follow these steps. Click the contact you want to work with to open their profile. Click the All Activity drop-down menu and choose E-commerce to view orders associated with the contact. Your contact's e-commerce purchases will display by date. For each transaction, we'll include the number of items purchased, the order total, and order number. Click the order to view the details in your connected store. Total revenue data will appear in the top-right corner of the contact's profile. Some e-commerce platforms will add past purchase information to contact profiles that didn't result from one of your campaigns. In this case, the e-commerce data on profile pages will differ from the data in your campaign reports. After you analyze your revenue, learn about some resources that can help you earn even more. Learn how to segment your audience based on purchase activity.